What is a scheduled task on my Windows 7 computer? 1. Go to "Control Panel\System and Security\Administrative Tools"
2. Click "Task Scheduler" to run it. You see the Task Scheduler screen showing up with 3 panels: "Task Scheduler Library" on the left, "Task Scheduler Summary" in the middle, and "Actions" on the right. 3. Double-click on "Task Scheduler Library" on the left panel. You see a list of all scheduled tasks showing up in the middle panel. 4. Click "View > Show Hidden Tasks" menu to make sure it checked. This allows you to see hidden tasks. 5. Scroll down the list and click to review each one of them to decide to keep, disable or delete it. 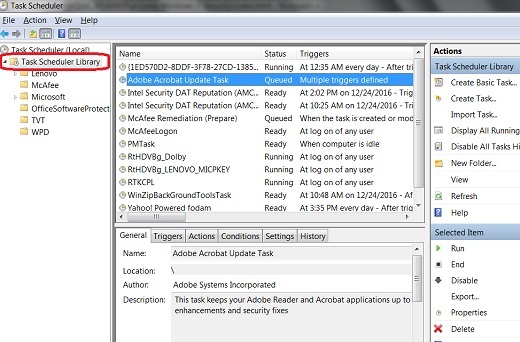 For example, if you click on "Adobe Acrobat Update Task", details of this task will be display at bottom half of the middle panel with General, Triggers, Actions, Conditions, Settings, and History tabs.